I love reading books to C. I loved to read books as a child too so I really hope that he will be the same. 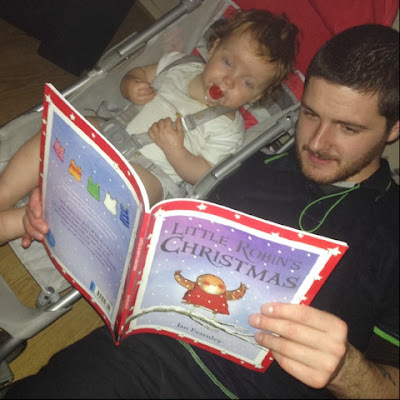 We recently received a copy of Little Robin's Christmas and I was so excited to get reading a festive book to him. The story is about a little robin redbreast who, at Christmastime irons out 7 vests for himself ready for the cold days ahead. He bumps into some friends on his journey outside and notices that they are all cold so he shares out his vests until he doesn't have any left (even for himself!). I won't spoil the ending but it is very happy as someone comes to HIS rescue. It is a really lovely book and is beautifully illustrated. It teaches kindess, selflessness and a little bit of karma too! C is only 15 months old so he only really enjoys hearing us read it to him and looking at the pictures but I hope to read this book to him every Christmas and hope he learns a little something! You can buy your own copy of Little Robin's Christmas from Egmont at a fab price of £6.99. 2 comments on "Little Robin's Christmas"
Aww this seems like a nice story love reading to my kids they get so much from it. Charlie true to read book himself by simply explaining the illustration, he is not far wrong usually !